Bring the family, and enjoy a ride from the Boone & Scenic Valley Railroad’s depot to the North Pole (and return). En route, you will hear the story of Santa’s Scenic Valley Ride, sing holiday songs, and take part in other fun, family activities. Also on board, you will be served hot chocolate and a cookie, and children will get to meet (and receive a special memento from) Santa himself. Experience what has become a tradition for families from across Iowa, and beyond. Basic Coach Class tickets are $18 per person (age 2 and up), First Class Coach tickets are $45 per person (age 2 and up). Seating on the Santa Express trains is assigned by party. At the time you place your order, please let us know if you would like to be seated with another party. Tickets for this event go on sale November 1. Purchase by clicking here, or by calling 1-800-626-0319. When they go on sale, tickets may be purchased online or by calling 1-800-626-0319. No. All tickets will be held for pick-up at the depot ticket window on the day of your ride. What are the differences between basic coach and first class coach? Our first class coach car has onboard heating, and is constantly heated. Basic coach class cars are preheated before boarding. Depending on outdoor temperature, wind speed, and direction, cars can cool off before we get back to the station. Our best advice is to dress in layers. The floors are concrete, so wear warm footwear. First class coach passengers receive a commemorative ceramic mug, while basic coach class passengers do not. Santa will pass through the first class section first. Sleigh bells given to children in first class coach are larger than those given to children in basic coach class. The purchase of a ticket does not entitle you to an entire bench seat. Bench seats are designed to hold two adults. The purchase of a ticket entitles you to half of a bench seat. Coats and/or jackets must be worn, held in your lap, or placed in overhead luggage racks. Please be considerate of other passengers — do not take up seating space by filling empty seats with coats or jackets. What takes place on the Santa Express? As we leave the station, your car attendant will greet you, and briefly tell you about our operations, and maybe find out a bit of information about the passengers. 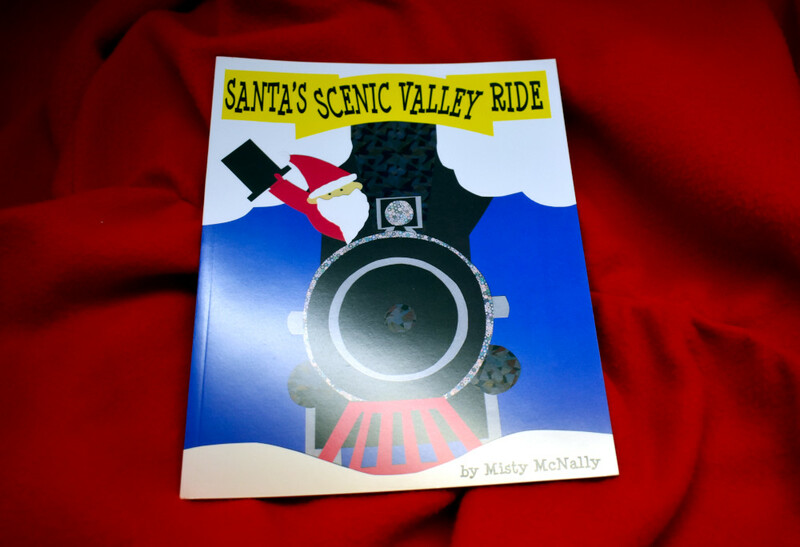 We will then read a new story, written just for us, “Santa’s Scenic Valley Ride”. The book is available in the gift shop, or may be preordered if you want to have one to read along with and see the pictures better. We will have an elf walking up and down the aisle, showing pictures from the book as the attendant reads the story. We should finish the story about the time we arrive at the “North Pole”. At the North Pole, Santa will get on the train. He will walk through the train, and greet each child and give him or her a bell. While he is doing that, the car attendant and elves will pass out cookies, as other servers pass out hot chocolate. When Santa gets through the train, he will de-board and stand by his workshop. We will wave goodbye to him and head back to town. During the ride back, we will sing seasonal songs, tell holiday riddles and jokes. When we get back to town, we will help everyone de-board safely. When do I need to arrive at the depot? We request that you arrive 45 to 60 minutes before the departure time printed on your confirmation or tickets. That will give you time to get parked, pick up your tickets at the ticket window, and use restrooms before boarding. You can browse our gift shop and museum while waiting to board. These are winter trains, so expect and allow for winter driving conditions. Trains do depart on time, and are not held for late arrivals. Basic coach class cars are preheated before boarding. Cars can be very warm when you first get on. Depending on outdoor temperature, wind speed, and direction, cars can cool off before we get back to the station. Our best advice is to dress in layers. The floors are concrete, so wear warm footwear. Our first class coach cars have onboard heating, and are constantly heated. Will the “Polar Express” book be read? Due to copyright constraints, the “Polar Express” book is no longer read. The ride usually takes about 1 hour and 15 minutes, but can vary a bit depending on how long it takes Santa, and the servers, to get through the train. The weather man says we might get snow. Is the train going to run? Typical winter weather does not stop the train from operating. Check our website, Facebook, or Twitter feed for the latest status updates. If we cancel the train (usually due to ice or a blizzard), we may try to reschedule, or a gift card will be issued. Ticket holders will be required to call us to make arrangements to reschedule or to receive the gift card. Does the steam engine pull the Santa Express train? The Santa Express trains are pulled by a diesel locomotive. Will we be getting off of the train? No. All activities take place on board the train. There will be no refunds or exchanges. In the event of the cancellation of a train, a gift card will be issued. As trains often sell out, advance ticket purchase is highly recommended. Seating on the Santa Express trains is assigned by party. 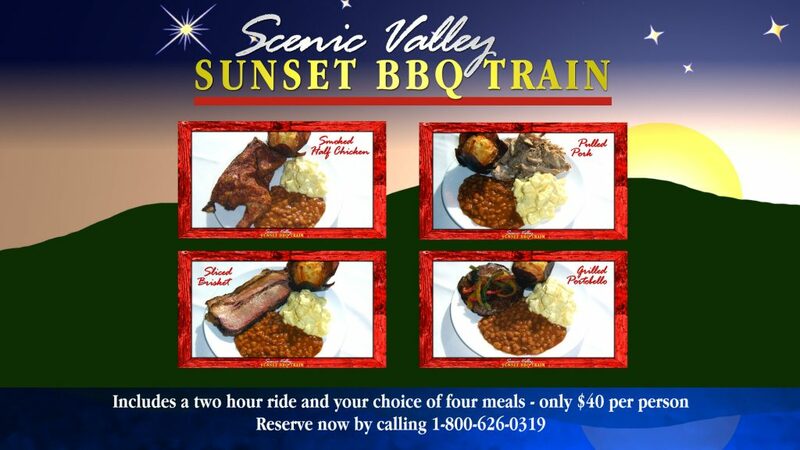 At the time you place your order, please let us know if you would like to be seated with another party. In the event a Union Pacific train is blocking the street you are on, proceed east to Benton Street, turn left & proceed north through the underpass, turn left & proceed west on 11th Street, turn left & proceed south on Harrison Street until you reach the B&SVRR parking lot. On-site parking is available. Street parking is also available. There is no additional cost for parking. Strollers and/or car seats are not permitted on the train. An area for stroller storage is available in our ticket office. Toddlers must be held/seated on your lap.